Singapore, Oct 26 (IANS) United States’ tennis player Venus Williams on Thursday defeated Spaniard Garbiñe Muguruza 7-5, 6-4, to book a place in Singapore’s WTA Finals last four for the fifth time in her career. In her first appearance in the season-ending tournament since 2009, Venus ended Muguruza’s run in the event, reports Efe. Caracas-born Spaniard Muguruza was in need of a win over Venus to secure a place in the last-four round for the second time in her career. Committing 32 unforced errors, Muguruza could not repeat her win over the seven-time Grand Slam champion in the Wimbledon final earlier this year. 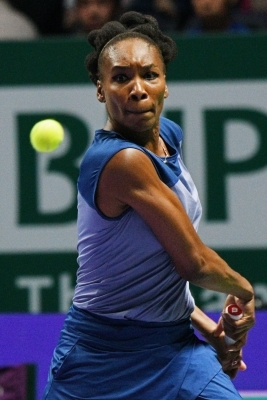 The 37-year-old Venus reached the semis in each of the four previous participations in the tournament, winning the title in 2008 and losing the 2009 final to her sister Serena Williams. Although Muguruza took the lead in the seventh game of the first set, Venus broke back immediately. A second break in the 12th game was all Venus needed to seal the first set. Again, Muguruza squandered a 3-1 lead in the second set, as she conceded her serve four times to pave the way for the American to advance as White Group runner up. Venus joined Czech Karolina Pliskova, the White Group winner, in the semis.